Portability or power? That used to be the choice you had to make with power tools. “Cordless” enabled greater portability but demanding jobs like drilling into concrete or masonry often required more power. With Bauer, you don’t have to choose between portability or power—you get both! Featuring a high-performance motor, the Bauer Hypermax Lithium Hammer Drill delivers 0-7200/0-27,200 BPM for drilling into concrete or masonry. All-metal gear construction provides durability while the lightweight design and textured overmold grip reduces user fatigue. Use the two-speed selector to match speed and power to your particular application. Easily switch from drilling to hammer drilling to fastening mode! A bright LED light illuminates your work areas for increased visibility. The hammer drill also features a ½ in. keyless chuck for quick bit changes. The kit comes with a rugged tool bag, two impact bits, charger and 1.5AH battery that’s interchangeable with all Bauer 20V cordless power tools. Check out the Bauer 20V Hypermax Lithium 1/2 in. Hammer Drill Kit as well as the whole line of Bauer tools and accessories at your local Harbor Freight Tools store! EarthQuake XT air impact wrenches have been shaking up the industry for a while now. Videos like this one from Real Tools Reviews shows how EarthQuake XT stacks up against Snap-On on power, functionality and price. EarthQuake is clearly the better value! Sometimes, more portability is needed and that’s when you’ll want to turn to a cordless impact wrench. The main concern when you go portable is power. But no need to worry about that because the EarthQuake 20V Max Lithium 3/8 In. Cordless Xtreme Torque Impact Wrench delivers big— 370 ft. lbs. of bolt breakaway torque for lightning-fast removal and 0–2000 RPM. It’s powerful enough to use in the field with no need for an air supply! This cordless impact wrench has a super rugged design featuring a metal nose piece and all-metal drivetrain for extreme durability. Additional features included an ergonomic overmold grip to reduce fatigue, variable speed trigger, electronic brake for precise control (helps avoid overtightening) and a built-in LED light to illuminate your work area, like dark wheel wells. The EarthquakeXT Lithium battery system provides extended run times. The long-life, high-capacity 4.0 Ah lithium-ion battery has a “fuel gauge” that lets you know when it’s time to swap out batteries. Also, the battery has no memory so it can be used with a partial charge. When you want to go cordless, visit your local Harbor Freight Tools store and check out the EarthQuake 20V Max Lithium Three-eighths In. Cordless Xtreme Torque Impact Wrench Kit complete with impact wrench, charger, battery and sturdy carrying case. If you need even more power, you can move up to the 20V Max Lithium 1/2 in. Cordless Xtreme Torque Impact Wrench Kit which delivers up to 1200 ft. lbs. of breakaway torque and 0-1700 RPM. These are some of the most common bits to find in the handyman’s toolbox. Used with either a hand or electric drill, the front edges cut the material and the spirals remove the debris along the length of the bit. However, there is a lot of variation with these bits. HSS (High Speed Steel) bits are generally characterized by their black color but more expensive and durable ones may contain cobalt or titanium coating (identified by the gold color). Titanium increases the hardness of the bit and facilitates a lubricating quality which is effective when drilling metals but has little impact on other materials. Harbor Freight has several Twist Bit sets from which to choose, including the Titanium Drill Bit Set 29 Pc. These titanium drill bits run cooler, drill smoother and last up to three times longer than standard drill bits. The bits range in size from 1/16 in. to ½ in. in 64ths. Harbor Freight also carries the 115 Pc Cobalt Drill Bit Set. These cobalt drill bits retain their hardness up to 1000 degrees Fahrenheit making them ideal for drilling cast iron, heat-treated steel, stainless steel and other hard materials. With 135 degree tips, the cobalt drill bits not only last longer but also cut faster than standard high speed steel bits. These bits are best used on wood (some plastics) and are characterized by a small point at the tip of the bit. Spurs on either side cut clean, straight holes. They’re ideal for drilling holes for dowels, which is why they’re also called dowel bits. These drill bits are a staple for wood workers. Harbor Freight offers the Brad Point Wood Drill Bit Set 7 Pc with 3/8 inch cutdown shanks. These outstanding bits resist skating and feature extra sharp flutes designed to smooth hole sides while ejecting chips faster to prevent overheating your drill. For projects utilizing either hard or soft woods, this set of brad point bits gets the job done quickly and accurately. These bits are designed to cut large, deep and accurate flat-bottomed holes. The spiraling shaft comes to a fine, threaded point while the single spur cuts and defines the hole’s edge. The threaded center bites into the wood, pulling the bit into the timber. This pulling action makes it unsuitable for use in power drills. Harbor Freight has several sets of auger drill bits available, starting with the Auger Bit Set 7 Pc. These 7-1/2 in. long auger bits make fast, clean holes in both soft and hard woods. The bits are made of heat-treated alloy steel that resists damage from nails. Other features include quick-change 3/8 in. dia. hex shanks and a ¼ in. bit with a ¼ in. hex shank. Other Harbor Freight auger bits set include the 18 in. Ship Auger Bit Set 3 Pc and Stubby Auger Bit Set 6 Pc. The pointed tip centers the hole as the paddle-shaped blade bores large, wide holes. Sizes are clearly marked on the face of each bit. These larger bits require a fairly powerful drill and lend themselves to drilling fairly large flat-bottomed holes with a center point—works especially well when the head of a screw or bolt needs to be recessed in the lumber. The bits can cause a lot of splintering as they breakthrough the work piece but a sacrificial backing board will reduce this. These bits are not recommended for enlarging an existing hole. Harbor Freight offers a variety of wood spade bit sets, including the Steel Spade Drill Bit Set 13 Pc. The extended spurs effortlessly cut crisp, clean holes in thick stock. Each bit is forged and heat-treated to withstand rigorous use. The ¼ inch quick-change shank works with drills and impact drivers. Other Harbor Freight offerings include the Steel Spade Bit Set 6 Pc, Steel Large Diameter Spade Bit Set 4 Pc, and the Steel Stubby Spade Bit Set 3 Pc. As the name implies, these drill bits are designed to be used on masonry material, including brick, block, stone, quarry tiles and concrete. The cutting tip is often made of tungsten carbide bonded to a spiral steel shaft. Generally, masonry bits are used in a hand drill but can also be used in a hand brace or hammer action power drill (though cheaper bits can shatter due to the action). Long masonry bits can be used for drilling through masonry walls. Harbor Freight provides several masonry bit options, including the Masonry Drill Bit Set 5 Pc featuring M2 high-speed steel shanks and C2 carbide tips with 6% cobalt. The 8 in. SDS Masonry Bit Set 6 Pc features a superior hardening process and an enhanced flute design that helps the bits run cooler. The tips of these bits are designed to penetrate tile or glass, then enlarge the hole as the bit penetrates the material. The tips are usually made with tungsten carbide. The bits can be used in a hand drill but are best used with a variable speed power drill on a slow speed. Lubricants should be used to keep the tip cool when drilling. Harbor Freight offers the Carbide Tip Glass and Tile Cutting Drill Bit Set 6 Pc featuring C-3 tungsten carbide tips and a steel shaft for drilling glass, ceramics, plastics and Formica tiles. The wide base angle provides precise, stable drilling. Using a power or hand drill, these bits penetrate material and form a conical recess to accommodate the heads of countersunk screws. Countersink bits are generally designed for use on softer materials. Harbor Freight carries the Carbon Steel Tapered Drill Bit and Countersink Set, 22 Pc. The bits are made from heat-treated steel and designed with a unique single-twist design to remove material more efficiently, resulting in cleaner holes. The set includes seven drills, seven countersinks, seven stop-collars and an individually organized wooden storage box for easy transport and organization. These bits are used to form holes with flat bottoms, such as with kitchen cupboard hinges. It’s best to use a power drill with a drill stand for optimal accuracy. Harbor Freight offers two Forstner bit sets, the 1/4 in. – 1 in. Forstner Drill Bit Set With 3/8 in. Shanks 7 Pc featuring high carbon steel construction and 3/8 in. reinforced shanks, and the 1/4 in. – 2-1/8 in. Forstner Drill Bit Set With 3/8 in. Shanks 16 Pc which includes more bits and a wood carrying case for storage. That’s just the basics when it comes to drill bits. There are many other types of specialized drill bits as well, such as screwdriver bits, plug cutters and nut drivers. For the full selection of drills bits and accessories, visit your local Harbor Freight Tools store or the Harbor Freight website. Yup, it’s getting colder and wetter, and DIY warriors are retreating behind closed doors for the winter. The LAST thing you want to do is curl up on the barcalounger and remain in a vegetative state ’til the thaw. How about a fun garage project to keep you engaged, limber and rewarded with a cool, new addition to the yard for when the sun comes back out? This actually really is a fun project (well… minus the breaking-down-the pallets part, but it’ll keep you warm) and the effort is well worth the pleasure and admiration you’ll get for your labors. So, without further ado… the Vintage Ice Chest! Because most of the materials will be coming from (hopefully) salvaged pallets, the expense should be minimal. If you don’t already have one, you should pick up a 48-qt. cooler. Assembly – 4 hours approx. Once you’ve dismantled your pallets, sort your wood: the heavy 2×3 supports, the 30” wood slats (will vary). There are an average 6 boards per pallet side. Choose the pieces you want to use for the front. As you see here, ink-stamped pieces were chosen. Using pieces of various shape is best to give it that rustic look. OK, you’re ready for the fun part, putting it together! This is where I pass you on to Instructables.com, and “miamitreasure,” who shows us how to assemble our classic pallet ice chest cooler. Also, check out these other pallet wood projects on Instructables! If you’re missing any tools or supplies for this awesome project, don’t forget to swing by Harbor Freight where you’ll find just what you need at low, low prices! Owning a miter saw brings with it a world of opportunities for DIY home repair, home improvement and building projects that can add so much to your home. Take, for example, a treehouse or playhouse for the rugrats, a new deck for the patio or adding crown molding to the house– all for so much less than if you had someone else doing it. As one becomes comfortable with their miter saw, it soon becomes the most used power tool in their arsenal. Chicago Electric has an excellent 12″ miter saw (#61969) with a number of useful features: double-bevel so you don’t have to flip your work over and reset cutting angles; sliding compound so you can cut larger pieces; laser guide for more accurate cuts. And this best-selling unit can often be found on sale at Harbor Freight at a much lower price than you’ll find elsewhere. Recently, this X Desk project caught my eye. Here’s a great example of a doable miter saw project, even for relative newbies who want to spread their wings, for a very approachable price: $55 in materials. I found it on Ana White’s site, a source for so many inspiring DIY projects. She re-posts a plan shared by Whitney from Shanty2Chic, but I chose to reference Ana’s site for its graphics. I also like how folks who follow her example post their creations on her site with all kinds of variations and added ideas. Take the time to read through the whole article before you start mobilizing. You want to make sure you’ve got a good working area, including a clean, level surface. When you pick out the wood, make sure all the boards are straight. Always pre-drill your holes before attaching the screws. Use glue with finish nails for a strong, solid hold. Wipe excess glue off the bare wood so you can stain it. Here’s a diagram of the X Table with the dimensions. If this looks like a project you might be interested in pursuing, take a look at Ana White’s plan. It’s extremely detailed and easy to follow– and the graphics are awesome! Check out Ana’s site for other projects as well, and make sure to visit Harbor Freight Tools for all your tool needs! Last night the wife and I were watching one of those “fixer upper” shows on the”house channel” (which is what I call it anyway). It was one of those typical episodes where a couple finds a house to fix, they run into major unexpected issues, they roll their eyes at each other, and at the end some happy homeowners are clinking glasses of cheap white wine with their new neighbors. Or something like that. Anyway, during the phase where the significant other is filling the house with furniture and charming antique commode-plant holder decor, a couple of the lackeys haul in this beautiful, rustic dining table. “Wow,” I comment. “That’s cool.” “Yeah,” says the Mrs. “That’s a farm table.” To which I give my usual response, “Huh.” It really was a great piece, and I decided I wanted to build one. Which leads me to this article. Farmhouse tables (or farm tables) are those warm, rustic benches that makes you think of humble families gathered around American dinner tables in the 18th and 19th-centuries. Instead of being built by skilled craftsmen, they were put together with rough, sturdy planks and their solidity was appreciated scads more than their detail or refinery. Today, farmhouse tables can still bring charm to any home, complementing matched or mismatched chairs, and whatever other furniture you’ve collected. Plus, they’ll take a massive beating and still be worthy of heirloom status when it’s time to pass them on. Furniture stores like Restoration Hardware sell farmhouse tables at a premium, even thousands of dollars. Imagine if you could build your own– just as nice and rugged– for under $100. 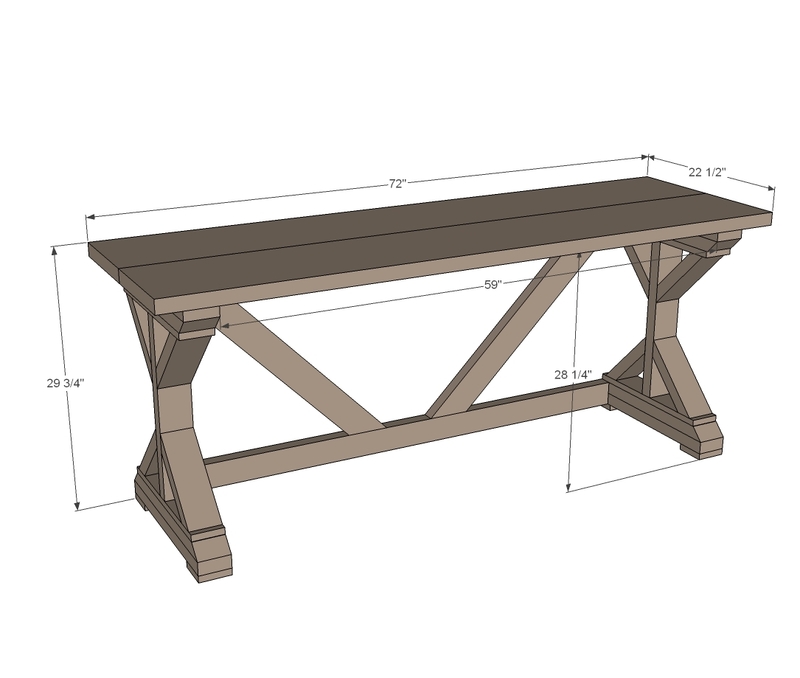 There are a number of sites offering DIY plans for building your own farmhouse table, ranging everywhere from extremely ambitious to pretty succinct. The plan I liked the most, as far as taking it and making it your own, is on Ana White’s site. Not only are her instructions refreshingly legible and professionally illustrated, but she only requires five tools in the arsenal to make it happen (excluding tape measure, marking pencil and safety protection, that is). Another extremely helpful feature, Ana includes a scrapbook of a number of variations others built using her plan. Not only does it reflect how friendly her approach is to personalization, it offers a plethora of ideas to consider when you go for it. As for the tools needed, you probably already have a couple of them. Ana originally listed a power drill, but I’d like to take it a step further, considering all the screw driving that needs to be done and recommend this 18-volt 3/8″Cordless Drill/Driver by Drillmaster. With 21 clutch settings, a keyless chuck and a reverse, this workhorse costs less than $25 and will give you more than enough performance for this project. The circular saw Ana used was an 18v 5-1/2″ cordless model with a laser guide. I recommend this Chicago Electric model, SKU #68849. Not only does it have the same size and features as hers, but it’s less than half the price. Ideally, you’ll already have an air compressor so all you’d need to pick up is a pneumatic brad nailer. If this is the case, this Central Pneumatic 18-Gauge Brad Air Nailer is a tireless performer that’ll get the job done and be ready for more. And for less than $20, it’ll leave you plenty to keep the cooler stocked. If you don’t have an air compressor and don’t want to get one for just this product, a hammer and nail punch can accomplish the same task. It just won’t be as fast and effortless. You might say you already have a sander and don’t need another one, but I’m telling you, you’ll want this one. When the dust settles, when it comes to stripping paint from furniture, preparing new molding or cleaning up between finish coats, you won’t get more bang for your buck than with a random-orbit sander. It doesn’t leave swirls or scratches, you can go in any direction (hence the “random”), it’s a lot easier on the hand… it even smooths and cleans metal and composite materials like solid-surface counter tops. Use a Chicago Electric Random-Orbit Palm Sander (under $30) on this project and I’ll bet you a Buffalo nickel it’ll be your go-to sander from here on in. When building your table, you’ll need to check that the parts you’re assembling are “square.” You’ll want a measuring square for this. A lot of folks like using a speed square, however for a table this size I recommend a triangular rafter square. Pittsburgh makes a really nice one for under $2. If you’re a little fuzzy about the whole “squaring” thing, here’s a nifty guide on operating the rafter square. If you’re the type that’s more confident with a tape measure, you can also go the diagonal-route of squaring your table. As I mentioned, you can find a clear and basic plan on creating your own farmhouse table on Ana White’s blog site. Whether it be new lumber, reclaimed wood, repurposed bowling lane wood, or what have you, building this signature piece is very doable. And remember to stop by Harbor Freight Tools when you plan to start! There’s no way around it. If you’re planning to work on projects– be they builds, repairs or little home jobs like hanging a plant– you’re going to need to drill holes and drive in screws. Actually, a drill/driver should be the very first power tool you buy, ’cause you two will be having plenty of bonding time while hanging wall decor, assembling furniture, putting up curtain rods, building a deck, installing cabinets, etc.– not to mention, drive screws more quickly and powerfully than you could ever hope to by hand. What’s the difference between a drill and a drill/driver, you might ask? In a nutshell, a driver’s got a clutch that you can adjust for a desired torque. So, when you’re driving in a screw, the tool’s motor disengages when it reaches the set point and prevents the bit from stripping the screw’s head or driving it in too deep. A drill would just spin and spin until you released the trigger. A clutch’s settings can range from 1-to-10 or 1-to-20, with “1” disengaging with the least amount of resistance and the highest number disengaging with the most. There is also a high-low speed switch on the tool. Use this when switching between the driver and the drill for maximum torque and RPM. Select low for driving (screws n’ such) and high for drilling. Be careful, too, as you get familiar with your drill/driver that you don’t set the clutch too high when driving screws. Too much torque is powerful enough for the driver to twist in your hand if it suddenly hits a lot of resistance. Start with a lower setting and gradually dial up as needed. You also want one with a reversible feature. Located just in front of the clutch is the chuck which holds the drill bit. Chuck size refers to the maximum diameter of the bit that the drill can hold and sizes range from 1/4″, 3/8″, to 1/2″. A 1/4″ chuck is sufficient for a light-duty driver. A 3/8″ drill is common for work around the home and accepts a wide range of bits. A 1/2″ drill/driver handles all of the above, plus heavier applications.You’ll want to look for a keyless chuck that can be turned by hand. Turn it clockwise to tighten the drill bit and counterclockwise to release it. For the sake of brevity, I’m only going to talk about cordless drill drivers. If you’re going to be using the drill/driver a lot, you’ll want something that can go anywhere. Beyond the number of settings, features and chuck size, cordless drill/drivers are available in a variety of power options, such as 12-volt or 18-volt, and Ni-Cad or lithium batteries. The 12-volt drill driver is more compact, but the 18-volt has more power and run-time. Lithium-Ion batteries are lighter and smaller, but cost more than Ni-Cads. These trade-offs mostly come down to personal preference and anticipation of what the tool’s going to be used for. As “best-bang-for-the-buck,” I like the Chicago Electric 18 Volt 1/2″ Cordless Drill/Driver #62427. It’s 18-volt, which is great for all-around duty, it has variable speeds, reverse and it sports 23 clutch settings. To read more about its features and price, click here. Of course, if this choice may be more than you need, Harbor Freight Tools carries other models to choose from, as well as bits, extra batteries and chargers. Remember when your speakers were the nicest pieces of furniture you owned (even beating out the cable spool coffee table and matching orange crate record holders)? Even now, I”ll go so far as to say they’d still be the most gorgeous pieces in my house if I still had my Marantz quadrophonic ruling the roost. Ah, but the world has moved on to iPod docks and Bose Wave systems, and other soulless devices of aural sterility. Perhaps, though, your Pioneers (or JBLs or Advents) are still in the garage, under boxes of Christmas lights or the old carburetor you swore you were going to rebuild. Maybe the cones are shot, but you just haven’t been able to bring yourself to part with that beloved part of your history. Well, now you don’t have to! Not only can you keep your lattice beauties, but you can emancipate them from storage and return them to their rightful place– the entertainment room! Turn that deceased speaker into a liquor cabinet… or any kind of cabinet you like, as explained by Hippiesarah on Instructables.com. Here we proceed with the idea of keeping the cabinet looking like a real speaker. Of course, you can fashion it however you want. Step #1 – Gut the Sucker! Wear some nitrile gloves– or other type of gloves that keep you dexterous– when you’re doing this. The cabinet’s insulation might be fiberglass, which can irritate the skin. Remove the speaker cover. Most just pop off with velcro or pop-ins, but be careful not to break the cover frame from too much effort, especially if it’s an older cabinet. There’s also the chance it’s screwed in. Carefully remove the speaker, insulation, wiring and components. Once the speaker is completely gutted, put the cover back on. Then with a pencil, mark exactly where it lays on the face of the speaker. It’s important you don’t cut the opening bigger than the speaker cover, so as to maintain the illusion that it’s still just a speaker. Remove the speaker cover again and use a paint marker to clearly outline where you want to cut. Cut as straight as possible along your drawn lines. Once you’re finished, measure the width and depth of the speaker cabinet so you can cut your shelves. For this, you could salvage wood from old furniture or resort to buying a piece. Sand where needed and paint the interior and your shelves any color you like. If there is a hole on the back of the cabinet, you could simply staple black fabric over the opening– or you could keep it to string in a light cord if you want to add electric illumination. When the paint has dried, it’s time to add the hardware. At this point, you should have an idea where you want your shelves to go. If you want to make your liquor cabinet like this, give the top shelf a good height to store your shot glasses, then give the next shelf room enough for rocks or highball glasses. Screw the corner brackets on the bottom of your shelves, then to the speaker walls. You might find that when you start to add the hinges, you run into a small issue. If you want the cabinet to look like an ordinary stereo speaker, then exposed hinges betray you (et tu, hinge-ay?) In the top photo, see how the hinge lines up perfectly with a small space in the speaker cover? The fix: get a strip of scrap wood and sand it down till it fits tightly into the space. Then hot glue it into the cover and attached hinges as normal. With a quick dash of black paint marker, you can’t even tell anything was done. For convenience, and to add that touch of class, you may want to have a light in your liquor cabinet. This could be done by simply sticking in an LED click light with adhesive back, bringing electric lights through the cabinet’s back hole and stringing them around top, or getting one of those magnetic drawer lights that come on when you open the door. Step 8: Bar’s Open! Time to stock your shelves and lie in wait for your first unsuspecting guests! Or, let’s say you’ve got towers. Maybe you’d like to try something like this, not quite as clandestine. Whatever your inclination, you can refer to these basic steps and your once-retired stereo speakers can give you hours more of pleasure! And remember, Harbor Freight‘s got the tools that can make it happen! “Sound” advice, no? It was built in the late 30’s by Louis Rogers of Pasadena, California, a guy who literally saved his dimes for the little traveler so as to take his new bride on their wedding trip. The 8’x4’ floor plan had tongue-and-groove flooring on a pine chassis, a Chevy front axle with 28” wheels and 1926 rear fenders. The mini trailer slept two and had a raise-up deck lid for a rear kitchenette, complete with ice box and stove. A curtain-enclosure outside the starboard entry served as the “dressing room.” The whole project set him back about $60 ($1,026 today). This may or may not have been the very first teardrop trailer, but it was certainly in the ballpark. DIYers went crazy. They followed Rogers’ plans and soon added touches of their own. After World War II, subsequent models morphed even more, sporting Jeep wheels and exterior skins made from bomber wings. After the 50’s, though, their popularity waned as big RVs appeared. Then, once again, the teardrops returned with a vengeance. Today you can find a number of websites for plans (some free! ), photo galleries, forums and clubs. Teardroppers believe that creating, renovating and modifying unique, personalized models are what give the little campers their timelessness—and the most rewarding way to own a teardrop! The coolest part of all this is, you don’t have to be a master builder to make your own drop-dead gorgeous teardrop trailer. If you’ve got just a basic knowledge of woodworking and some tools, you’re already ahead of the game. …the author created this beautiful camping capsule, complete with aluminum siding, wiring and lights, vent fan, sink-&-stove kitchen area, windows on the sides and front, and a roomy bed with a second kid-sized bunk, all for under two grand! While it’s not exactly a 2-weekend project, the finished product will leave you buzzed with such sublime satisfaction, and give you years of fun and memories that you just can’t buy. Of course, most of the tools necessary to make this dream a reality can be found at Harbor Freight Tools. Make sure you check the ads for specials and coupons for even greater savings! So, up ’til now you’ve proven your manhood through food dares, awkward school fights, asking-a-girl-out dares, changing your own oil, jumping in a frigid lake with your bros, peeing in a soda bottle whilst driving through the night, crying at the end of “First Blood”… but lately, you’ve been getting a growing hankering to MAKE something– something COOL. If this is uncharted territory for your ever-emerging MAN within, here’s a DIY project worthy of bragging rights and endless sprees of fist and chest-bumping: The Man Table. The Man Table, by definition, should be rugged, solid, rough-hewn and indispensably usable. Something that takes a beating and just smiles back at ya. This isn’t a beauty contest, bucko. We’re talking about a baptismal exercise of Man and Tool. I actually stumbled on this “how-to” quite by accident on Instructables.com by a guy named “Pointy” in the Netherlands, and I’ve been thinking about little else for future garage activity. Just be warned, this project is “metric-centric,” so get used to using the other side of your tape measure. Measurements 700mm (2x), 1600mm (2x). – Reclaimed wood for the inlay (Meranti is used here). Bear in mind that the thickness of the MDF + inlay = 27mm MAX when using 3mm steel. Otherwise, the wood will be too high above the tabletop. If you can get the steel angles at a metal shop that will cut them for you (45 degree angles), go for it. Your world will suddenly get so much easier. Use regular steel, not stainless, for two reasons: One, you’re using it inside and it will be painted. Two, stainless is harder to weld (and for paint to stick on it. and regular is cheaper.. so, four reasons). First step, lay out the four pieces of 30×30 into a rectangle. If the steel isn’t cut in angles yet, do that now, using the grinder with the cutting disc. Take your time measuring out the angles, using the angle gauge, always measuring twice before you cut. If you cut them at the wrong angles, you might be forced to to shorten the whole thing to make up for the mistake. You can only fix so much with the welder. After cutting the angles, lay the pieces together. Do they fit? Are there any obvious gaps? If not, then sweet! A trick the tutor used with his stick welder was grind a small angled edge of the materials to be welded. By doing that he created a ‘path’ to drag his welding rod on. Get out the welder and tack-weld it first. That way you can fix and prevent mistakes before the whole thing is welded solid. As said, this isn’t a beauty contest, so don’t worry about having photogenic welds. The primary goal is only that they’re tough and can take a pounding. Switch the grinder to the grinding disc now and clean up the welds. Fill in the gaps with the welder and grind it flat again. Don’t sweat any grinding marks you might leave. This is all about badass Man personality, right? First you need to cut the corner braces. Stick a piece of painters tape diagonally from corner to corner, making a 45 degree angle. An unwanted result of welding flat objects is the risk of them curling up when you’re just welding one side. To prevent this, tack the corner braces on and then flip it and weld the other side, too. That way you make sure the brace is flat and flush against the tabletop’s frame. Use the clamps to keep it from curling and keep them clamped until they cool. By tacking and flipping you can work a lot quicker. Just make sure to add the corner braces before welding the legs. Be sure to suspend the legs in mid-air before welding the braces on. This is why you see bolts in the above photo. After welding the corners, then grind and clean them up. Now to drill the bolt-holes. Three bolts per side are sufficient– and it looks good. The corners should be 15.5 cm. The first bolt goes in dead center in the corner profile and the rest space out + 5CM. Center punch it first to prevent your drill from slipping. To save time, drill all the holes before moving on to the next bit size up. When you get finish with the 2mm holes, put the tabletop frame upside down and line up the legs flush with the top. Then insert drill bit in each hole and give it a little spin. This way you don’t have to centerpunch the legs and they all fit nicely to their corners. Then do 5mm, repeat, then 8mm, repeat. Finally, span your 10mm bit and give each hole a quick spin. This will remove any burrs left. This is a pretty straightforward step. Legs + top + bolts: First bolts go in with the table upside down, then flip the frame and do the rest of the bolts. Sit on it to test the weight. As the pride floods you, feel free to let out a Tim Taylor grunt. Either cut your MDF board to size yourself, or have it done at the local home improvement store. You won’t lose Man Points if you do the latter. There’ll be some small cuts you need to make to accommodate the bolts; just measure how much the bolts protrude, and maybe a 1/2 cm extra, and saw. It doesn’t need to be precise, the wood will be covering it. Finally, the last step is to drop in your reclaimed wooden top. As I mentioned earlier, this DIY guy used reclaimed Meranti. You may have your own ideas. Just lay it down, mark off any protruding stuff and cut. Then nail it down to the MDF. Now just let the Man within take over and do what you do with your magnificent creation. Maybe run your hands over the perfectly imperfect surface and watch the end scene of First Blood again.